Tired of paying a small fortune for basic TV? 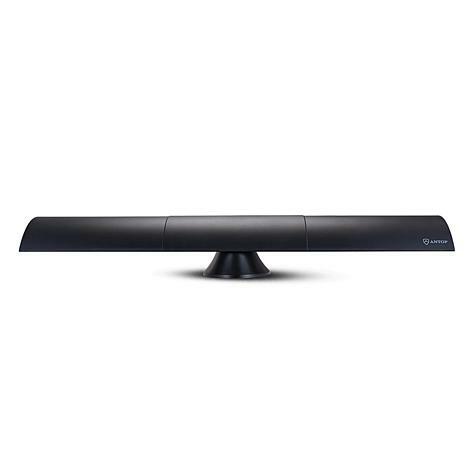 The ANTOP amplified indoor digital antenna puts free over-the-air HDTV viewing within your reach. 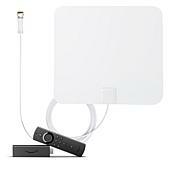 Receive popular channels like ABC, CBS, NBC, PBS, Fox, Univision and others from up to 65 miles away. 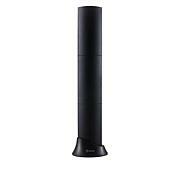 Multi-directional reception capable of receiving short-range and long-range signals gives you plenty of viewing options. It even works with 4K TVs! 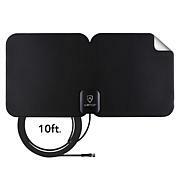 Obstacles such as metal in the walls/attic and high power consumption devices such as a freezer, air conditioner or power station elevator can shield the broadcast signal from your antenna and impact its performance. Position the antenna facing the broadcast tower(s), close to window, and as high as possible. Works very well. I installed in on a bedroom TV. I am 23 miles from the TV towers in North Phoenix. It picked up 38 channels when setup vertically on a 4 foot high bureau. However it did not pickup my local NBC station. I then put it in a horizontal position and it now picks up 65 stations including my NBC station and all local stations. Most have between 4 to 5 bars of signal - 5 bars is max. I'm happy with this antenna! We have a few VHF channels in our area, with this antenna we are able to get those stations. I didnt want to pay for cable anymore because it got too expensive. I had never used an antenna before, so I didnt know what to expect. I did check the signals in my area first. 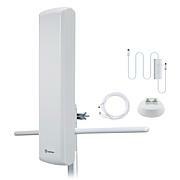 The antenna has enough power to bring in about 60 channels for me.